In this post, We will discuss how to enable Whatsapp calling on iPhone. This feature was earlier rolled out to Android users but not to iOS users. But using a trick, iOS users can aslo enable calling in Whatsapp. Whatsapp which has become globally popular messaging with more than seven hundred million active users has rolled out Voip calling feature recently. This feature is not yet available to everyone using iPhone. But this trick which we are going to mention enables you to make free calling through Whatsapp without any cost. Recent version of Whatsapp which is available in Appstore has got a Call button, but it’s not activated. For activating this call feature, you have to install the beta version of the app which can be downloaded as per below. 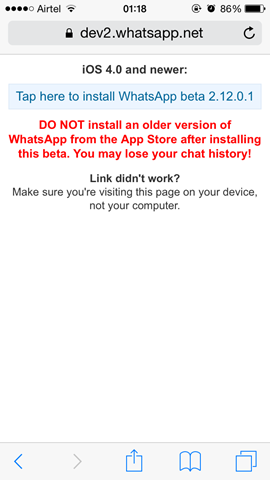 For downloading beta version of call activated Whatsapp app, your iPhone must be Jailbroken. If you’re not willing to jailbreak your iPhone then you are out of luck. The process of Jailbreaking your iPhone is quite simple using TaiG. 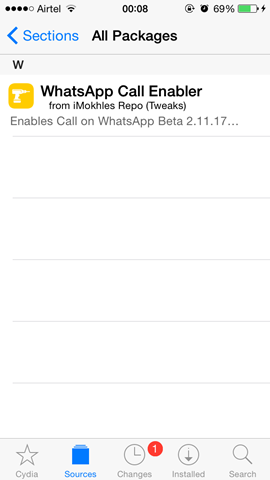 After installing Whatsapp beta on iPhone, Add the following repo to your Cydia sources from Cydia App. Open this new source and install whatsapp Call enabler and enable it from settings. Now the call activating feature is enabled in your Whatsapp Application, Next you’ve to enable in whatsapp server. For activating Calling Feature for your number in their server, all you need to do is get a call from already call activated whatsapp number. If you want to receive a call from us, just post your number in comments or message me your number. Share this post using hashtag #whatsappcall and reach more people who can help you with activation. Thanks. Will whatsapp calling work for iOS 7 users?